Gold Fields (NYSE: GFI), one of the largest unhedged gold producers in the world, is working on plans to increase gold production at its South Deep Mine to 1 million ounces a year, making it South Africa's largest gold mine. The South Deep Mine began initial gold production in December 2006 and produced 163,000 ounces of gold during it first year of production. In 2009, gold production from South Deep fell from the previous year to 175,000 ounces. This year, Gold Fields expects to increase South Deep gold production by 71% to 300,000 ounces. The company is spending 8.5 billion South African rand (US$1.2 billion) to get the South Deep Mine into full production by 2014, when it is expected to yield 800,000 ounces a year. After that Gold Fields' vice-president in charge of the South African region, Vishnu Pillay, says the company is looking at ways and means to bump gold production from the South Deep Mine over 1 million ounces per year. The company plans to increase annual gold production from all of is South African mines to 2.2 million ounces by 2015. However, some analysts doubt this target can be met. In our view, achieving this target is unlikely as the majority of gold mining projects of late have taken between six to eight years to move from conceptual phase into production. Also, Gold Fields has struggled just to keep production constant over the past 10 years, despite previous growth ambitions and a fourfold increase in its capital expenditure. As a result, we cannot help but caution that these growth targets are unlikely to be achieved. Despite pessimism from some analysts, others are bullish on Gold Fields' business strategy. Gold Fields was recently upgraded from Equal Weight to Overweight by Morgan Stanley. To reach the 800,000 ounce per year target, the company is upgrading its processing facility to handle 330,000 tonnes a month. 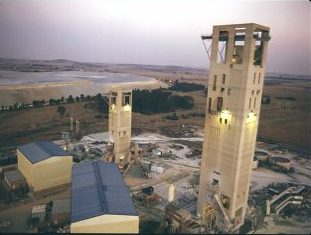 To achieve the 1 million ounce per year target, Gold Fields will need to expand the South Deep plant capacity to process 450,000 tonnes a month. With a focus on Africa, and Australiasia, the company is an important exporter of gold to India, where the demand for the yellow metal is soaring as investors seek a safe haven against financial woes. I recently published a new report for Wealth Daily that discusses the investment highlights mining companies that are working in countries that export gold to India. You can read my latest report for free by clicking here or finding it on the Wealth Daily website called: India's Gold Bull Market.